Miguel Díaz-Canel, the titular “president” sent to the United Nations to represent dictator Raúl Castro at the General Assembly this week, dedicated his address to defying U.S. President Donald Trump’s call for the world to reject socialism and warn the world it should “not harbor any illusions” that Cuba would change with his new title. The Cuban communist regime gifted Díaz-Canel the title of “President” in April. Under the Cuban constitution, the heads of the government are the commander-in-chief of the armed forces and the head of the Communist Party, who outrank the “president.” Raúl Castro kept two of the three titles and named his former vice president the “president” of Cuba. 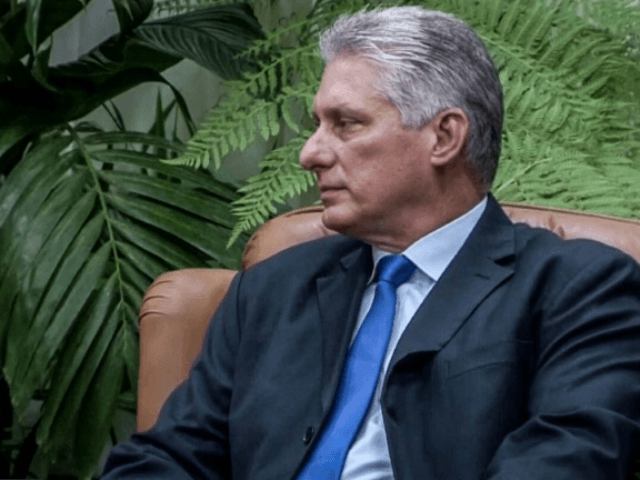 As the representative of the nearly 60-year-old regime, Díaz-Canel began his speech praising dictator Fidel Castro and mass murder Ernesto “Che” Guevara, “only to name the most significant” of the regime’s butchers, he noted. He then claimed “the richest 0.7 percent of the population owns 46 percent of all the wealth, while the poorer 70 percent of the population can access only 2.7 percent of it,” and proposed socialism and communism as a solution. The Cuban dictator’s subordinate spent much of his speech condemning the United States for Trump administration policies, including withdrawing from the Paris climate agreement, which he claimed “compromises the survival of our species” and its consistent condemnation of the Venezuelan socialist regime. Venezuela’s government is controlled by the Cuban communist regime, according to a wide array of testimonies from individuals who worked within Caracas. Pro-democracy activists have noted that nearly 100,000 Cuban government agents are stationed in Venezuela to run the government, condemning this as a textbook example of colonization. “We want to reiterate our full support to the Bolivarian chavista Revoution, the civil-military union of the Venezuelan people, and its legitimate and democratic government, led by constitutional president Nicolás Maduro Moros,” Díaz-Canel said, accusing Trump of reaffirming the Monroe Doctrine by calling for freedom for the Venezuelan people. Venezuela has held four fraudulent elections in the past five years and used violence to kill, injure, and arrest thousands of citizens who opposed socialism publicly, including political leaders who could have presented challenges to his presidency. He went on to defend the dictatorship in Nicaragua, which has killed over 400 people since April; call for the release of Brazil’s socialist ex-president Luiz Inácio Lula da Silva, serving a 12-year prison sentence for corruption; demand reparations for slavery for Caribbean island states (he did not specify from who); and call for Puerto Rico’s independence. Díaz-Canel finally made time to warn listeners that the Cuban communist regime had no intention of loosening its stranglehold on power or in any way liberalizing society.